Are you on the lookout for the best electric tankless water heater? Well, you’ve come to the right place. Here at ShowerInsider, we’ve spend countless hours doing the research and curating the top rated electric water heaters for every purpose. And we’ve put together this resource – a one-stop-shop, all-inclusive guide to help you find the best tankless water heater that can truly cater to all of your hot water needs. To help you make the comparison more easily, we have compiled a list of various water heaters on the market to help you make a more informed buying decision! 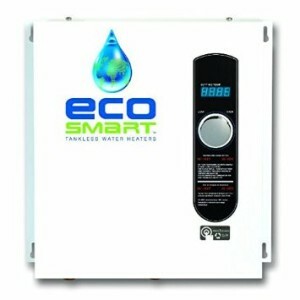 Ecosmart is one of the best manufacturer of electric tankless water heaters in the world. It’s a privately owned company operating in Miami, Florida. They are known for their eco-friendly, quality green energy products. Despite venturing into other industries, Ecosmart’s main business remains to be water heating products such as tankless water heaters, pool heaters, spa heaters, radiant heating systems, as well as accessories. About 25 percent of the average U.S household’s annual energy bills stem from heating the water. Ecosmart’s mission is to produce and distribute quality green energy water heaters that can reduce this energy consumption while protecting the environment. 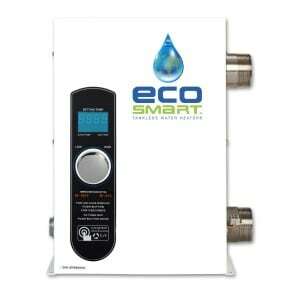 Ecosmart ECO 36 is one of the best tankless water heaters that Ecosmart has to offer. We’ve come across a ton of you who have used and swear by this water heater. It’s fully capable of fulfilling your needs for hot water whether you’re living in a flat or in a medium sized home. It’s also a perfect solution for small to medium sized office or business. While many electric tankless water heaters out there are not best suited for cold climate areas (i.e northern United States) where water temperature drops to as low as 37°F, The Ecosmart ECO 36 can deliver up to 3.5 GPM at this low temperature. Thus, it can handle up to two simultaneous showers without running out of hot water. In hot climate areas (i.e southern United States) can fulfill higher demands for hot water – At 67°F , the ECO 36 can deliver up to 6.5 GPM which is quite outstanding. Having said, you’ll literally never run out of hot water even if your demand for hot water is higher than the average. The only caveat I can think of is that the Ecosmart ECO 36 will not turn on and begin heating water until the flow rate is greater than ~0.25 GPM. Now, that’s water flow on the hot water line – not total water flow. So, even if you turned your faucet all the way to hot, you’d have to have at least 0.25 GPM of water before the heater would start heating up the water to your preset temperature. Additionally, although the Ecosmart ECO 36 heats the water immediately as it flows through its pipes, the delay in water getting hot at your faucet is caused by flushing out the water already in the pipes – between the water heater and the faucet – when you turn on the faucet. Stiebel Eltron is another recognizable brand that produces some of the best out there. The Tempra 29 is no exception. Stiebel Eltron has been in business for a very long time. The company was founded in 1926 by Dr. Theodor Stiebel who is among the pioneers of modern hot water supply with over 160 national and international patents. Today, Stiebel Eltron is considered to be one of the most authoritative brands in the water heating industry. They actually made a name for themselves not only in the water heating industry, but also in space heating and renewable energy. The Tempra 29 Plus is one of the best, powerful water heater on the market. It’s a bit expensive than most electric water heaters we listed here, but it’s very well-engineered and would be a great invesment for anyone who’s looking for a solid product that’s designed for whole house and commercial applications. 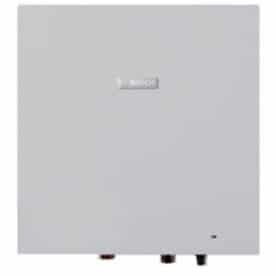 As with most electric tankless water heaters, the Tempra 29 Plus can be used in warm and cold climate areas. However, bear in mind that the colder the temperature of the incoming water, the lower the flow rate (GPM). For example at 40F, this water heater can only provide 3.0 GPM (gallons per minute), but at 75F, it can supply up 6.5 GPM. 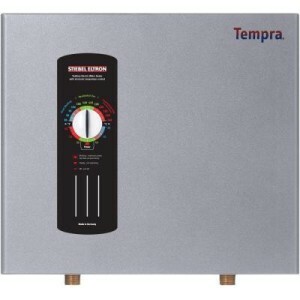 Like all Tempra Plus Series tankless water heaters, the Tempra 29 Plus features a digital temperature display and a relatively large knob which allows you to set the desired output water temperature at any level between 86 and 140F (30 and 60C). Additionally, these water heaters are equipped with true thermostatic temperature control and an advanced flow control technology which senses the incoming water temperature and constantly monitors the water flow rat, respectively.The unit adjusts the flow of water when the sensor’s detect that the flow demand is exceeding its capacity. In other words, the Tempra 29 will automatically sense the water flow rate and temperature, calculate how much power is required to heat the water to the pre-set temperature, and will apply exactly that much power so it can precisely maintain the desired water temperature regardless of whether the flow rate changes or not. The Ecosmart ECO 27 is a slightly less expensive, slightly less sophisticated version of the ECO 36. Both, the ECO 27 and the ECO 36 come with a lifetime warranty when professionally installed. They are also about the same size, and are equipped with the same technologies. The main difference between the two is the GPM (gallons per minute). Granted, the ECO 36 can provide more GPM than the ECO 27. This is due to the fact that the ECO 36 is rated at 36 KW at 240 volts, which means that internally there are four separate 9KW heaters, operating in series and in sequence based on demand, instead of just three separate 9KW heaters as it is in ECO 27. With that being said, if you are a budget-minded person living in a small flat and your needs for hot water are modest, then you don’t want to splurge on the ECO 36 when you can get the ECO 27 for much less. You may be asking yourself what this tankless water heater is doing on the list. It’s clearly outclassed by most of the other top 5. So why did we list it? Well, it’s because of the price. 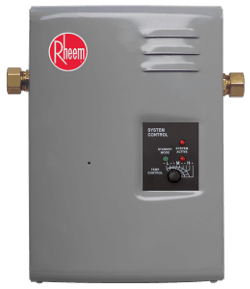 While most electric tankless water heater are priced above $500 easily, the Rheem RTE 13 gets the job done for much less. It’s actually one of the best tankless water heaters at this price points. And if you have never used a tankless water heater, this one is a good entry-level water heater if you want to test the water before upgrading to something a little more sophisticated. We do think you get a lot of bang for your buck with this ultra-compact size tankless water heater (9 x 10 x 5 inches). It’s one of the best selling eletric tankless water heater on the market. We have across a ton of you who have bought and loved this on demand water heater. The Rheem RTE 13 is quite easy to install. It’s best suited for singles and couples who don’t use much hot water. It might also be a good option for household members who do not need to take showers, wash clothes, and do dishes all at exactly the same time; you can also mount it as a backup water heater. Bosch is another example of genuine German engineering. Bosch is the largest manufacturer of home appliances in Europe. They are one of the pioneering brands in this sector worldwide. Bosch produces quality products and their tankless water heater line is no exception. The Bosch WH27 is a very compact, powerful eletric tankless water heater that can be installed virtually anywhere, it’s designed for commercial or residential applications. It’s capable of running up to 2 major application without running out of hot water. Additionally, it’s fitted with a built-in electronic flow sensor and modulating control unit which eliminates unpleasant temperature fluctuation, ensuring a constant temperature output no matter how great the demand for hot water is.